F-1 to F-2= .877” (although reverse F-1R, F-1X, and F-2 blowers are normally built with the F-3 shaft, assuming that they will be used for a reverse cog bracket). 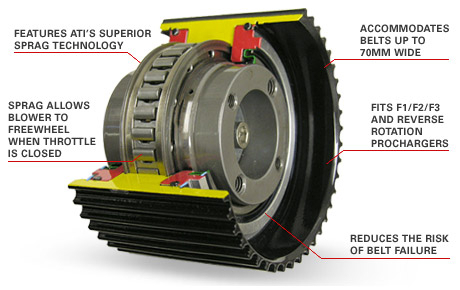 Designed to eliminate blower belt failure, ATI’s unique Supercharger Super Pulley allows your supercharger to “freewheel” when the throttle is closed. It’s ideal for both competition and street applications. 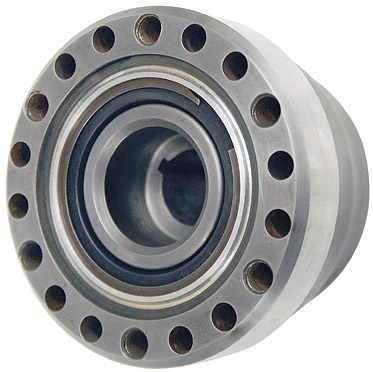 The pulley will fit F1/F2/F3 and Reverse rotation Pro Chargers, or any other style of Supercharger with .8750" or .9911" input shaft sizes. Current production is for 8mm HTD style belts up to 70mm wide. The Super Pulley is available in 45 teeth x 75mm wide configuration at this time. Part #916195-45 for small shaft size and Part #916196-45 for large shaft. Reverse rotation is designated with an R at the end of the part number. The Super Pulley uses ATI's Superior Sprag Technology™ to release the blower whenever it is spinning faster than engine RPM – thus virtually eliminating belt failures when the car is pedaled at the drag strip. Also look for more boost between shifts, as the blower will not ramp down as fast as the engine during the gear change. 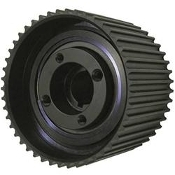 Finally, the pulley will also reduce wear on your Supercharger by not allowing the gear drive to mesh in the opposite direction when spinning down. This pulley has been thoroughly tested and it is ready for your ride.